From the Minnesota Avenue Metro (Orange Line), head east out of the station and walk ¼ mile down Grant Street until the intersection with 42nd Street. 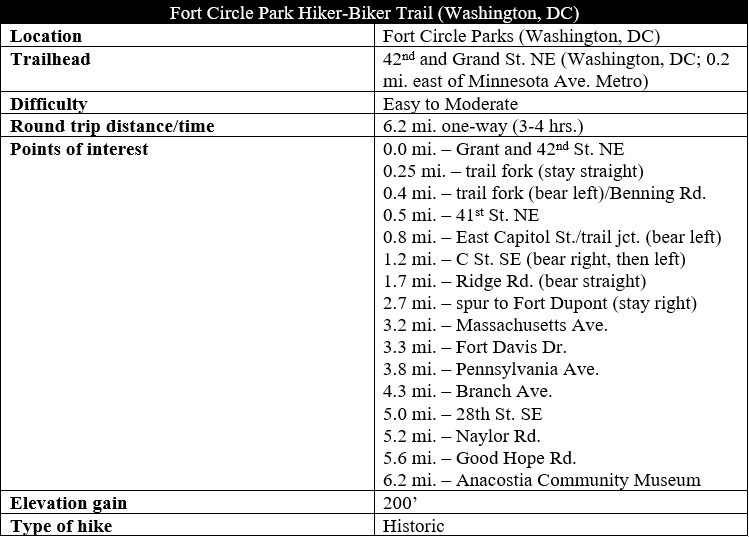 Here you can pick up the wide, paved Fort Circle Park Hiker-Biker Trail heading south. The path begins as little more than a glorified sidewalk, following 42nd Street southward into Fort Mahan Park. Fort Mahan was constructed in the first year of the Civil War to guard the entrance to Benning’s Bridge, which offered passage across the Anacostia River to central Washington, DC. It was an irregular structure with nine sides and underwent significant changes throughout the war, despite not experiencing any fighting in the war. Soldiers garrisoned at the fort were unable to view approaches to the fort from the parapet, so Union engineers spent much of the war’s length constructing additional rifle pits and small bastions to improve visibility and defend the fortification. Less than a minute from the hike’s start, the path crosses a gravel road leading up to a school and baseball field, and hikers will pass the first of several trail waysides (this one Mile Marker 6.2). These regular signs feature helpful maps and trail distances. 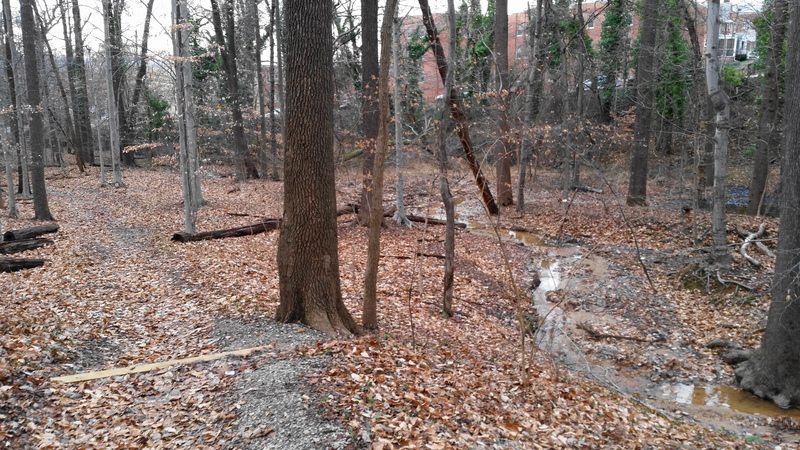 From here it is 6.2 miles to the end of the hike at Anacostia Community Museum. Continue south as the trail climbs into the woods for the first time. (Note: The path here is asphalted but wavy, making it potentially difficult for strollers.) On the left there is a set of exercise stations, and social trails bear off from the path to the right and left. Stay on the main track as it enters an open hillside at ¼ mile. One can follow the gravel path on the right up to a field that was once the heart of Fort Mahan—although today there is little to see except a grassy knoll. 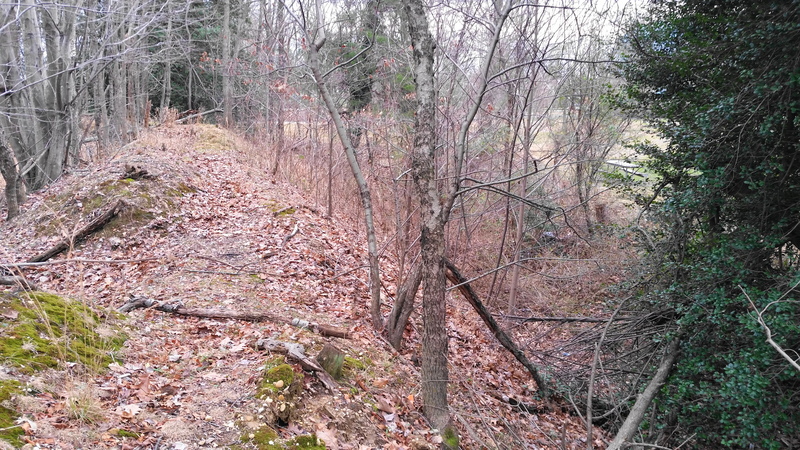 Hikers can discern the fort walls on the right, however, as the path drops back into thick woods. Soon the path breaks out into the open again and hugs the hillside as it bends westward. A fork comes at 0.35 miles, with the route continuing left. But first, head straight for a couple dozen yards to read the informational wayside on Fort Mahan, complete with a copy of a drawing from the US Army Corps of Engineers. Then return to the intersection and make your way down to Benning Road. Cross the street, then follow the roughly asphalted footpath as it follows Flint Place. At about ½ mile, the trail merges onto a well-paved track heading left. While the map appears to show the trail continuing through the woods, the way forward is not evident: instead, follow the paved route to its end at 41st Street, which is a dead-end road. Follow the street to its mouth: an intersection with busy East Capitol Street. Exercise caution in crossing the road, then bear right, following the sidewalk west to the next mile marker sign and continuation of the trail. From here the trail turns to dirt as it climbs south away from East Capitol. This area is Fort Chaplin Park. The primary remains of Fort Chaplin lie in the distance off to your left. This fort was built relatively late in the war—1864—to cover the flank of Fort Mahan to the north; it was never fully armed or garrisoned. Today Fort Chaplin Park is covered in thick woods, and the path winds around a set of shady bends before descending to the next road crossing: C St. SE. Take a right on the road, following it until the appearance of the trail continuation on the left. 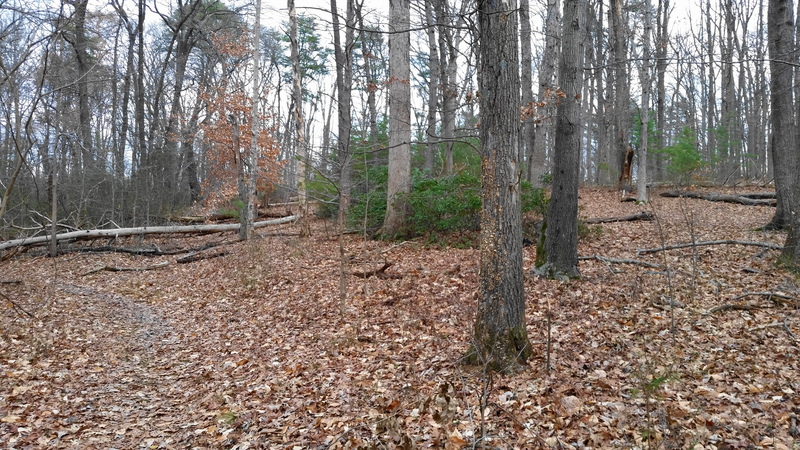 Here the trail enters a relatively long wooded area, flanked on both sides by residential neighborhoods. Down in the gully on the left is a small stream. It is a roughly 4/10-mile walk from C St. to the next junction at the corner of Texas Avenue and Ridge Road. Covering one of the most pleasant parts of the hike, the narrow footpath stays on the heights as the terrain drops significantly off to the right into a collection of woody ravines. 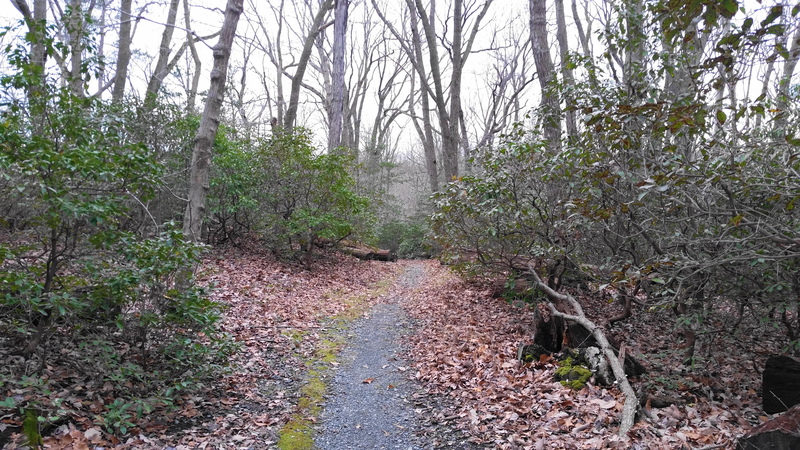 After a left-hand bend, the trail briefly climbs, then later drops through a surprising stand of mountain laurel, which continues to stay leafy green through the winter season. After rounding a long left-hand bend, the gravelly path approaches a junction. 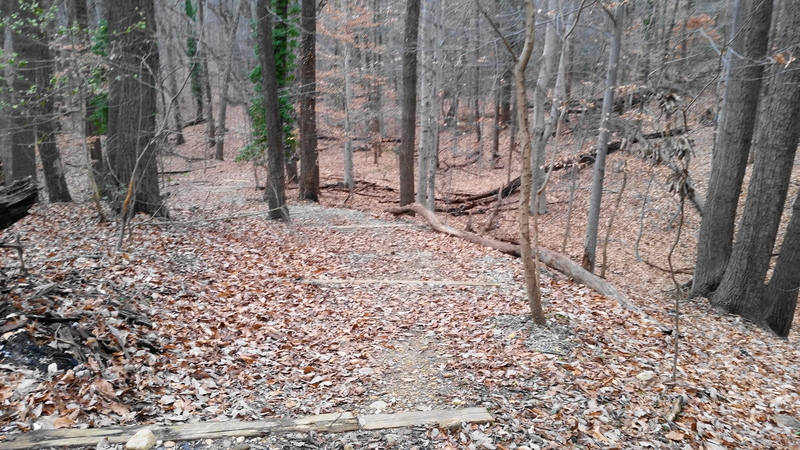 This is the unmarked turnoff for access to the earthworks of Fort Dupont. 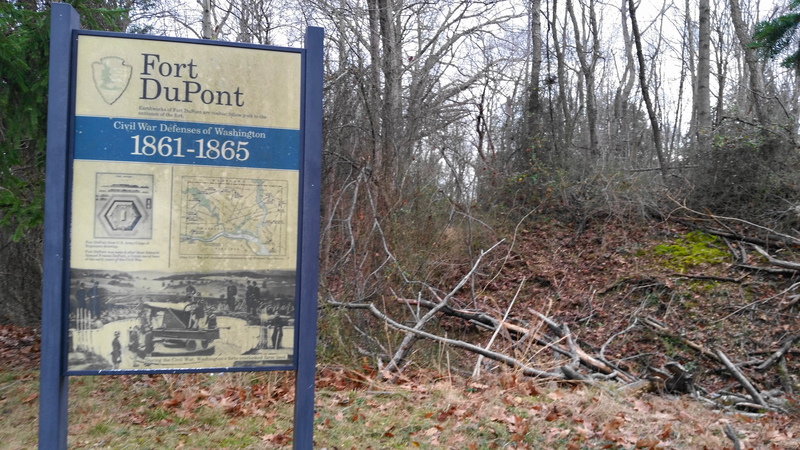 The ½-mile out-and-back spur (not included in the route total) is worth the trip, despite the relatively steep climb: Fort Dupont is relatively well-preserved and fun to explore. In its heyday, the fort featured steep sides and a protective moat and served as a sanctuary for runaway slaves escaping the South. Returning to the main trail, bear left and follow the winding path as it drops to clear a wooden bridge. Then the trail bears uphill again and weaves southwest to meet Massachusetts Avenue. Traverse the road using the crosswalk here, briefly returning to the woods before emerging again at Fort Davis Drive. The tread on the opposite side is briefly paved as it remains out in the open before returning eventually again to dirt. The trail in this section threads a small patch of woods in Fort Davis Park between Fort Davis Drive up to the left and residences down to the right. The route drops to cross a stream, followed by a second creek within 200 yards. Eventually the path climbs to a flat and crosses Pennsylvania Avenue, with a brief view of foliage-laden Fort Davis off to the left. This small post hosted eleven guns and a mortar and acted as an outer defense for Washington. Cross Pennsylvania Avenue to find the trail as it continues westward. This section is flat and sometimes muddy, although the terrain off to the right quickly begins to drop off into a series of ravines. (Note: The shiny, glass building on the left is the Francis A. Gregory Library.) The next road crossing is at Branch Avenue, roughly 4.3 miles from the start of the hike. Cross the street, then head straight on Park Drive, following it for roughly 100 yards. Here the trail picks back up again, heading back into the forest on the right. 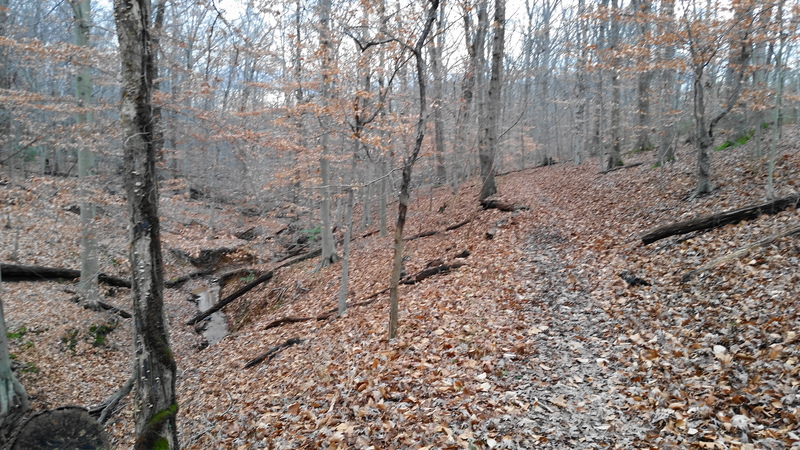 This section through Fort Stanton Park is relatively scenic, with a stream valley on the right and a trail that descends significantly down to streamside at about 4.9 miles. Another road crossing—28th Street SE—is just beyond. At this crossing, exit the woods and traverse the road, then bear left on the sidewalk, following it until the trail continuation appears on the right. 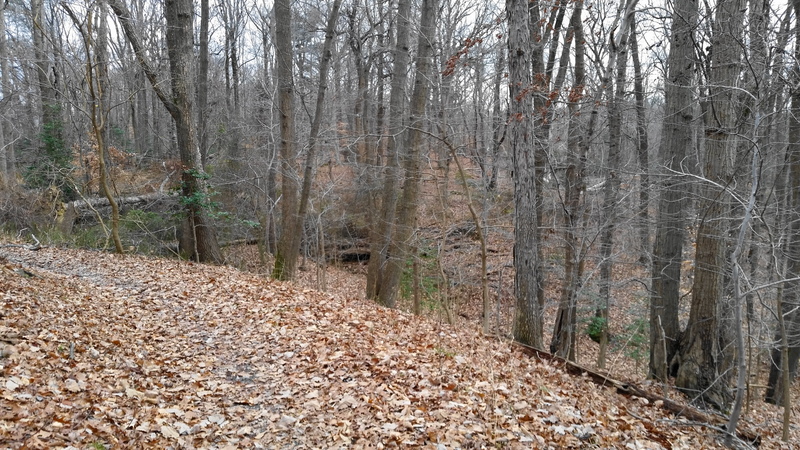 In this next patch of the woods, the path climbs a set of stairs to exit the stream valley and then temporarily leaves the forest at the corner of 27th Street SE and Naylor Road. Cross Naylor Road at the crosswalk to find the trail continuation. 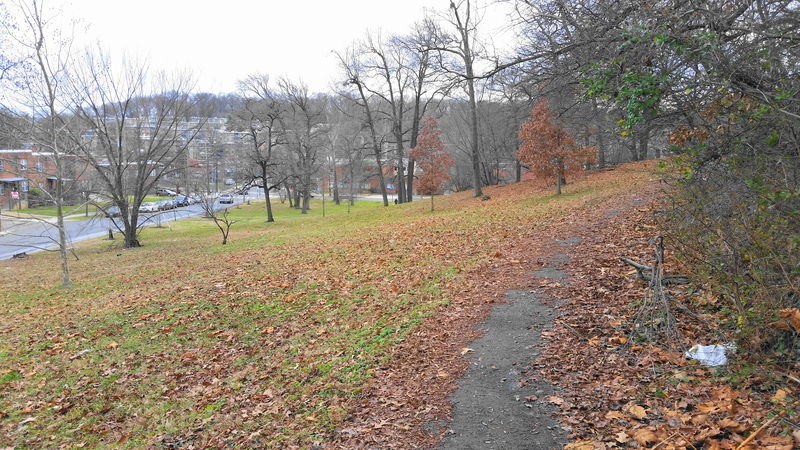 The following section gains some elevation, staying high and offering some obscured views as far as the Anacostia River and downtown Washington. 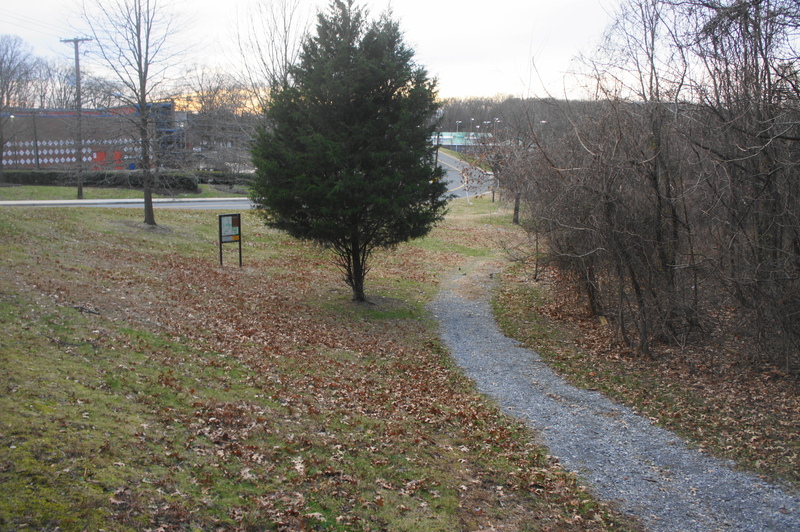 High rises on the right—the Marbury Plaza Apartments—eventually obstruct the views, and the trail descends a long, paved straightaway to Good Hope Road. After crossing the street, the trail returns to dirt and traverses a relatively flat and marshy area. 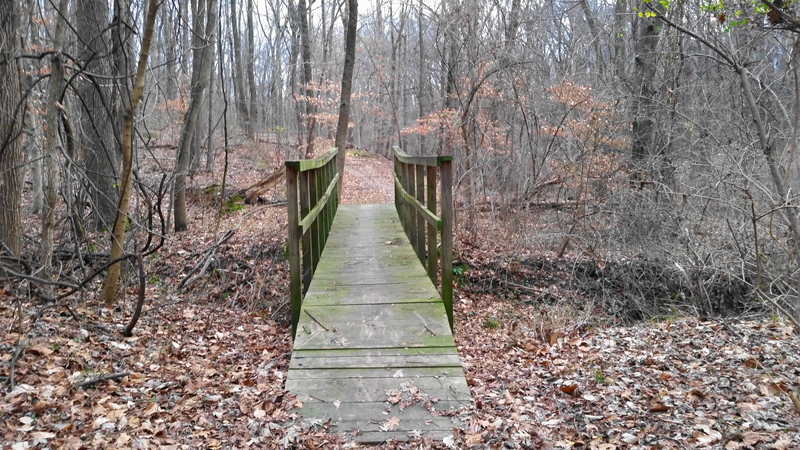 Eventually the flat gives way to a deep cut of ravines; with a confluence of creeks on the right, the trail crosses a pair of wooden bridges, followed by a steep uphill climb to a grassy, overgrown patch. 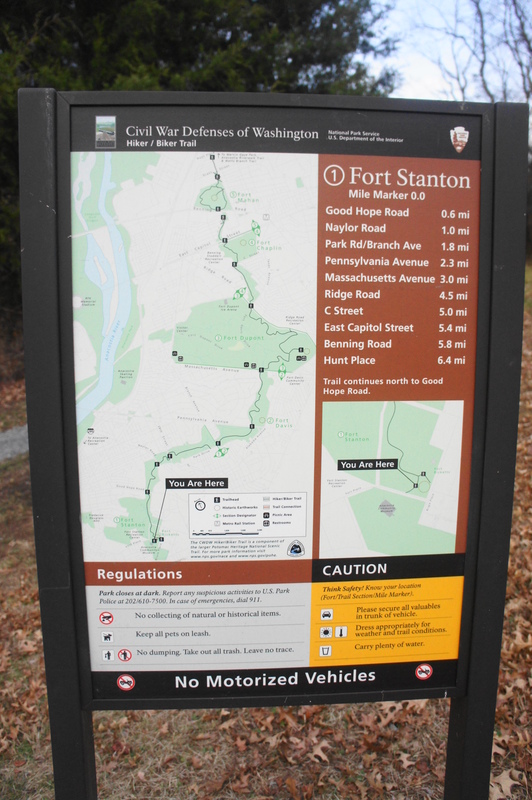 While not visible from the trail, Fort Stanton is off to the right about a quarter mile. Named for Secretary of War Edwin Stanton, the fort was constructed in 1861 to protect the nearby Navy Yard. By February 1862, the post was fully garrisoned and armed with ten 32-pound guns. Somewhere around here the trail enters Fort Ricketts Park, the final stage of the hike. Battery Ricketts is situated at roughly the end of the hike, as the trail climbs to merge with an old gravel road that cuts through a sliver of forest. 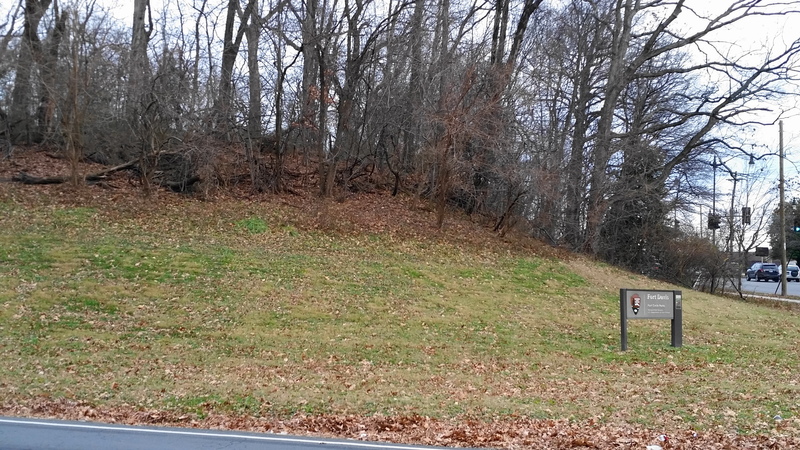 Remains of the earthworks are located directly across the road. This battery was constructed earlier in the war as well to cover a ravine that could not be defended by nearby Fort Stanton. Like most of the other forts surrounding Washington, the fort was decommissioned after the war in 1865. 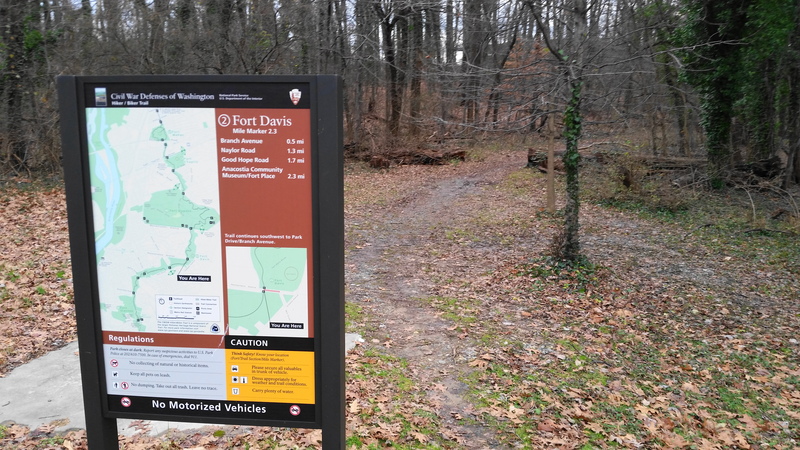 At the end of the hike, the gravel road cuts left to a picnic area and playground or right to an open field and the lovely Anacostia Community Museum—the southern terminus of the Fort Circle Park Hiker-Biker Trail. From here, it is a 1.2-mile walk to the nearest metro station—Anacostia—to the northwest. 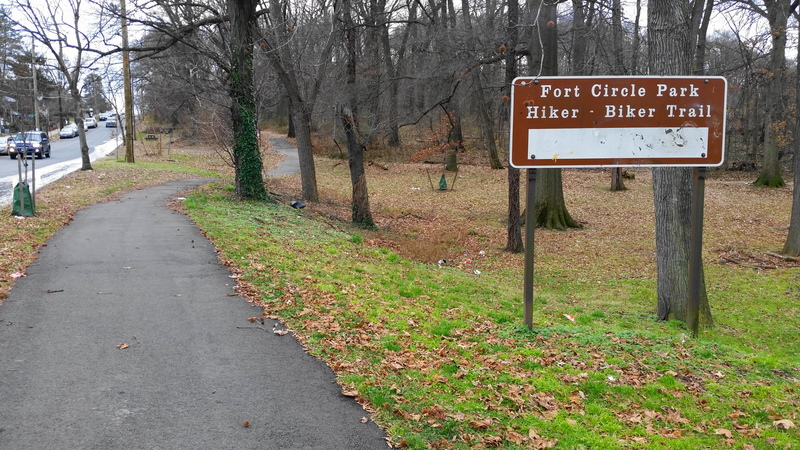 For a city hike, the Fort Circle Park Hiker-Biker Trail is relatively demanding because of its length and makes for a pleasant half-day walk. Allot 3-4 hours for the entire one-way hike of 6.2 miles (and additional, ½-mile side trip to Fort Dupont), plus additional time to/from the Metro if you do not live in the area or are without a car. This entry was posted in Civil War, District of Columbia, Moderate Hikes and tagged Anacostia, Anacostia Community Museum, Civil War, Civil War Defenses of Washington, fort, Fort Chaplin, Fort Chaplin Park, Fort Circle Park Hiker-Biker Trail, Fort Circle Parks, Fort Davis, Fort Davis Park, Fort Dupont, Fort Dupont Park, Fort Mahan, Fort Mahan Park, Fort Ricketts, Fort Ricketts Park, Fort Stanton, Fort Stanton Park, historic, Minnesota Avenue, Washington DC. Bookmark the permalink.